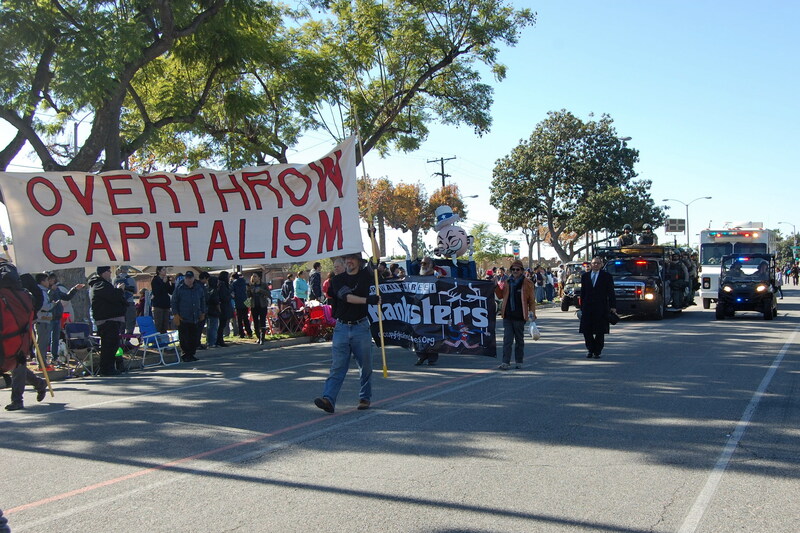 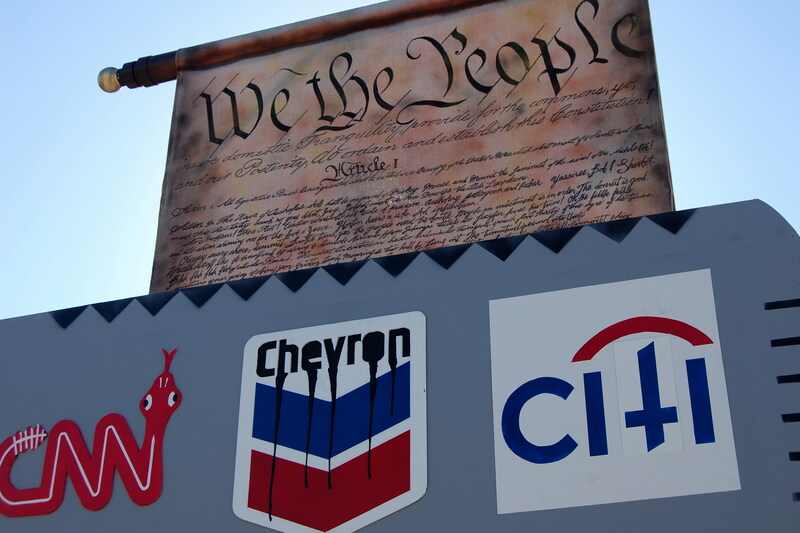 A people’s parade protesting the corporate takeover of our democracy trailed the official Tournament of Roses Parade. The Occupy the Rose Parade #OTRP tradition continued for the fourth year in a row on January 1, 2015. 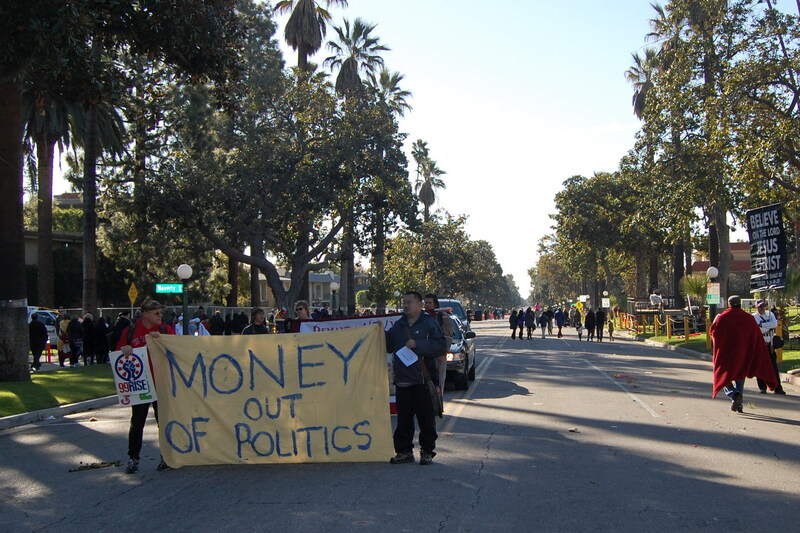 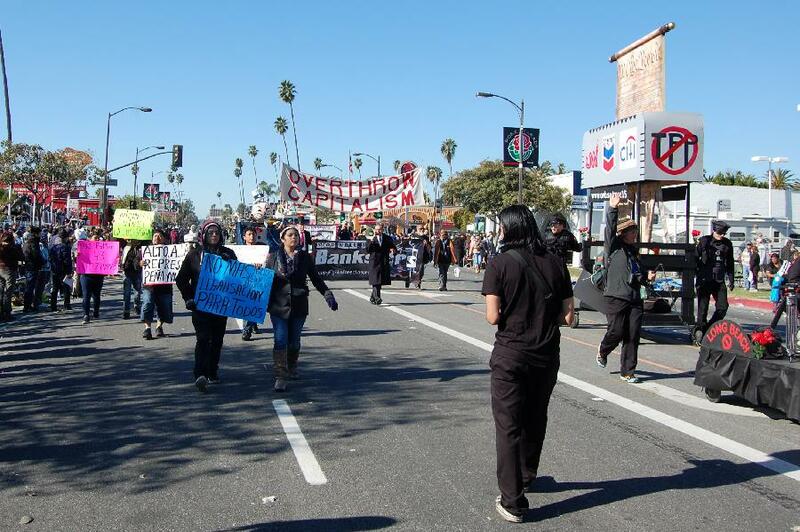 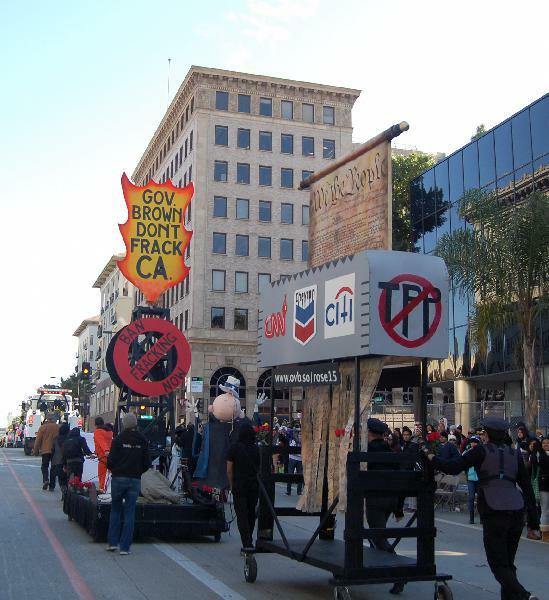 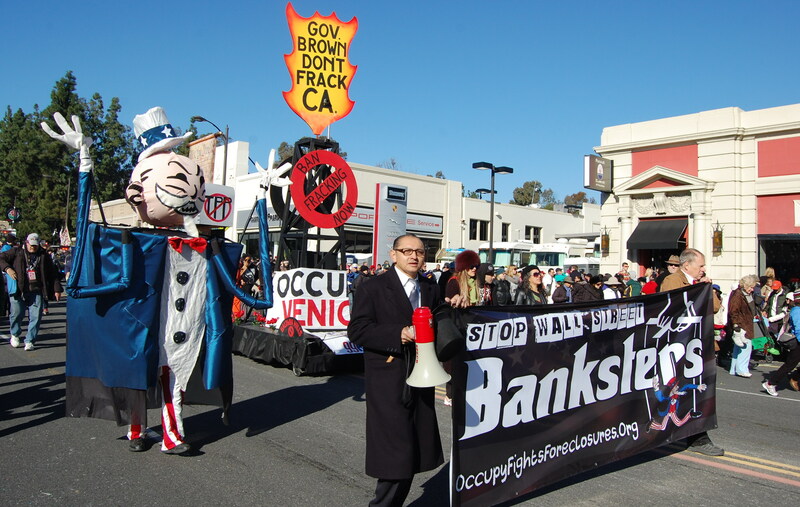 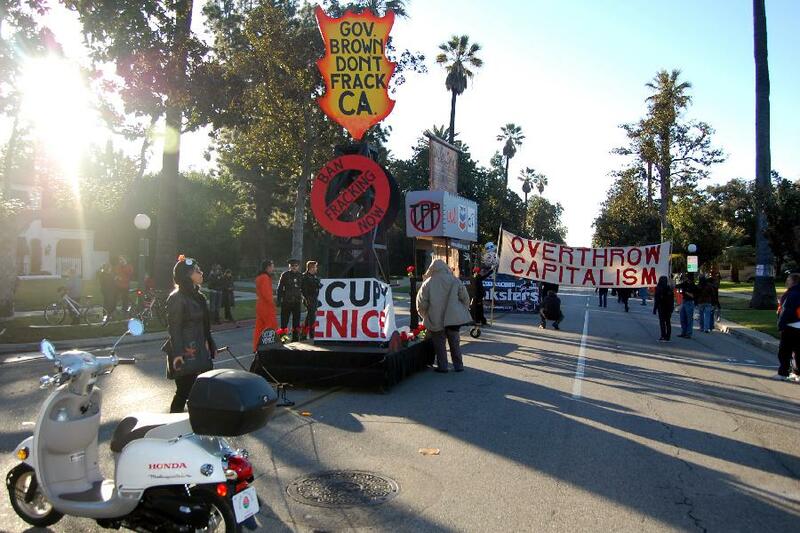 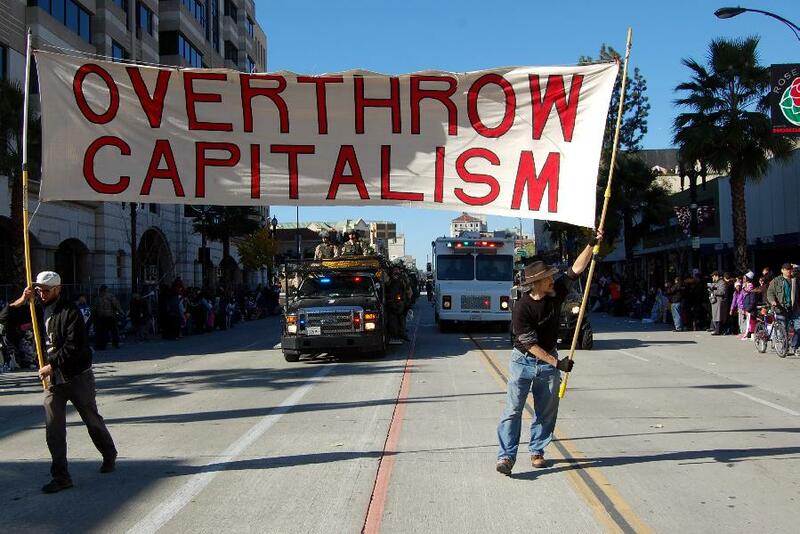 Pasadena, CA – A people’s parade aligned with the Occupy Wall St. movement trailed the official 2015 Tournament of Roses Parade in near-freezing temperatures Thursday morning. 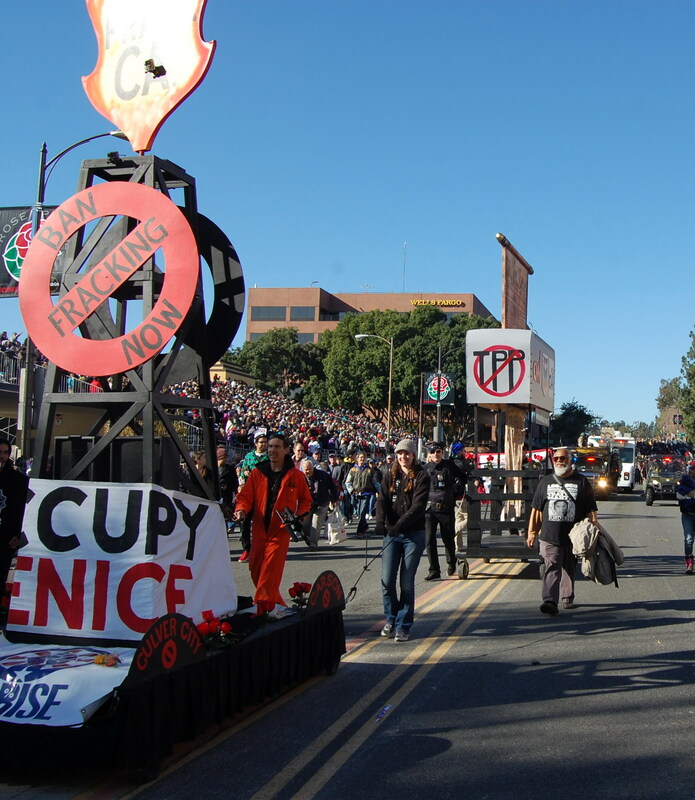 The Occupy the Rose Parade tradition returned for the fourth straight year in a row, joining the 126th Rose Parade in front of one million live spectators on New Year’s Day. 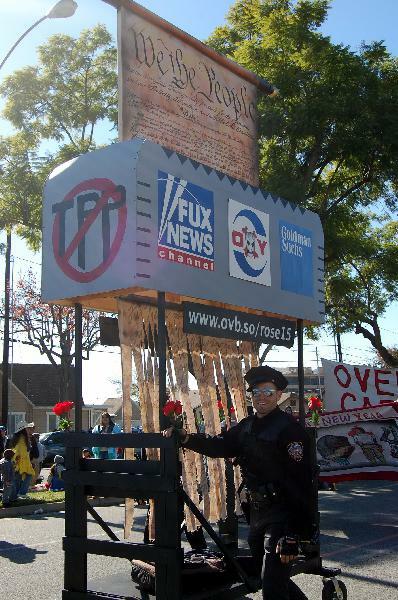 True to their tradition, KTLA turned off their live broadcast prior to the arrival of the Occupy the Rose Parade floats and banners. After the Kiwanis International float departed the corner of California Blvd and Orange Grove Blvd, several Pasadena Police, Homeland Security, and other law enforcement vehicles blocked the path of the people’s parade. 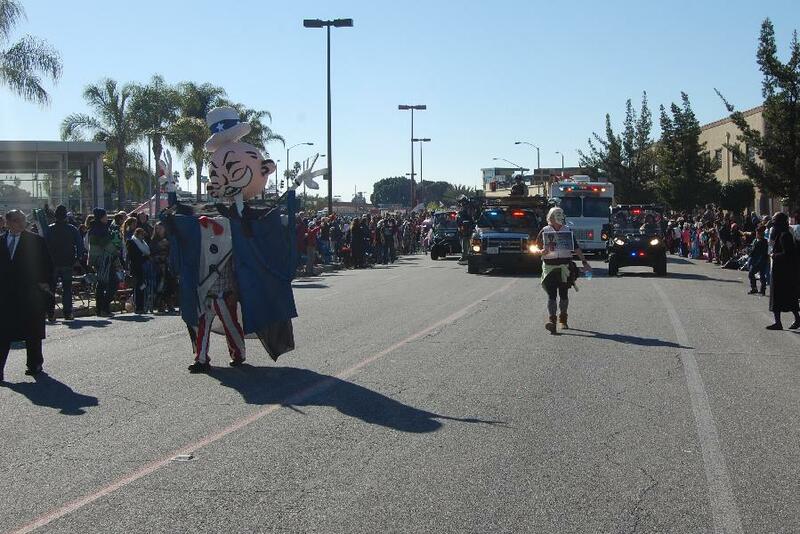 Los Angeles Sheriff Department deputies on foot directed the march to wait until more than 10 tow trucks entered the parade route, and then Occupy the Rose Parade was directed to continue, flanked by another police car at the rear. 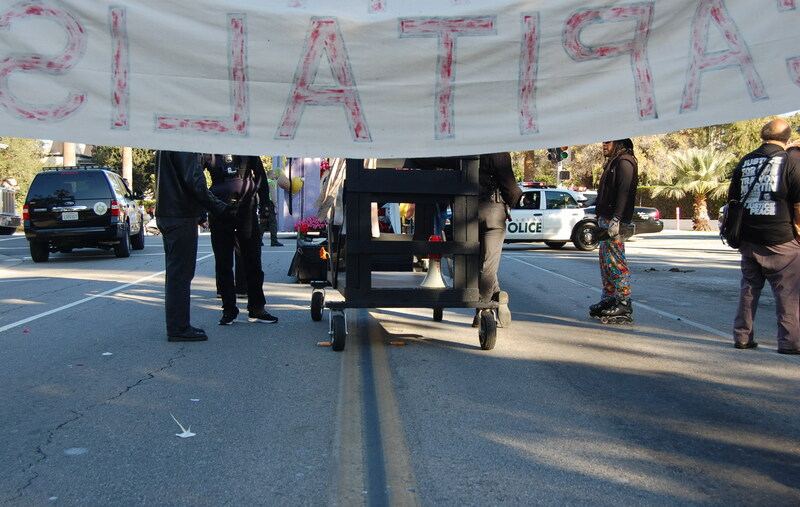 At several points along the parade route, militarized vehicles containing riot police joined the procession. The occupation of the Rose Parade grew in size while parading down Colorado Blvd. Anonymous joined the march with a message, “Who Will Protect the Public When the Police Break the Law?” A man rollerskated to both sides of the street with a re-purposed Styrofoam floral holder bearing the message “Support Native Rights.” Half a dozen people joined with Spanish language signs on fluorescent poster board, including “Nos faltan 43” and “No Mas! Legalización para todos.” Dollhouse Juan of Occupy Los Angeles jumped up from the crowd to dance with the parade. Occupy Fights Foreclosures chanted over a bullhorn as the parade passed one of its big bank sponsors along Colorado Blvd: “Hey Wells Fargo, You Can’t Hide! 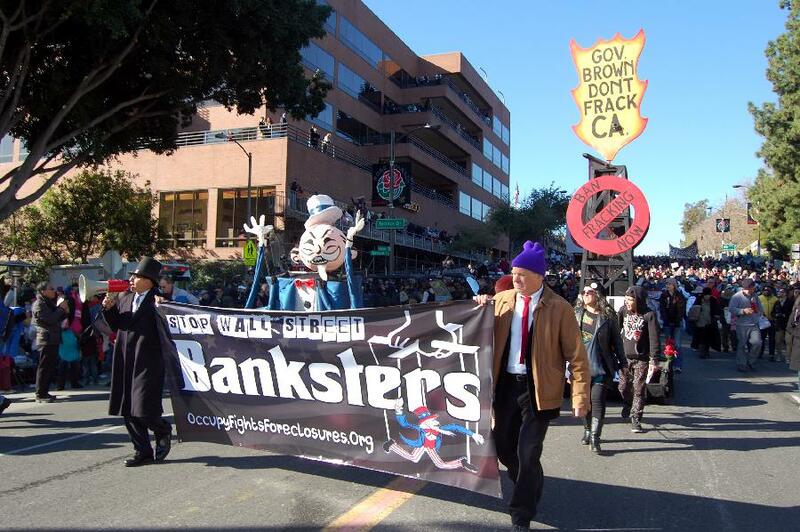 We Can See Your Greedy Eyes!” The protestors shamed Wells Fargo, Bank of America, and other Wall St gamblers for continuing to profit while Main St Americans lose their homes. 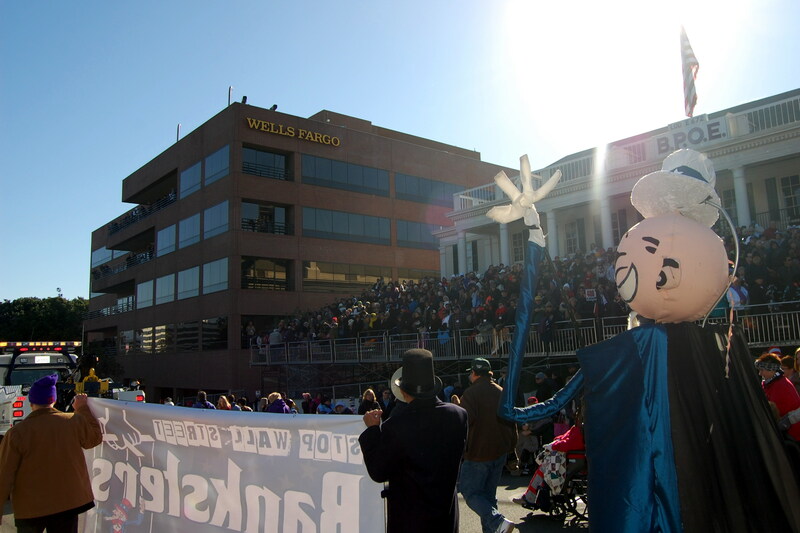 Thousands of spectators remained in the grandstands to watch the unsanctioned post-parade. 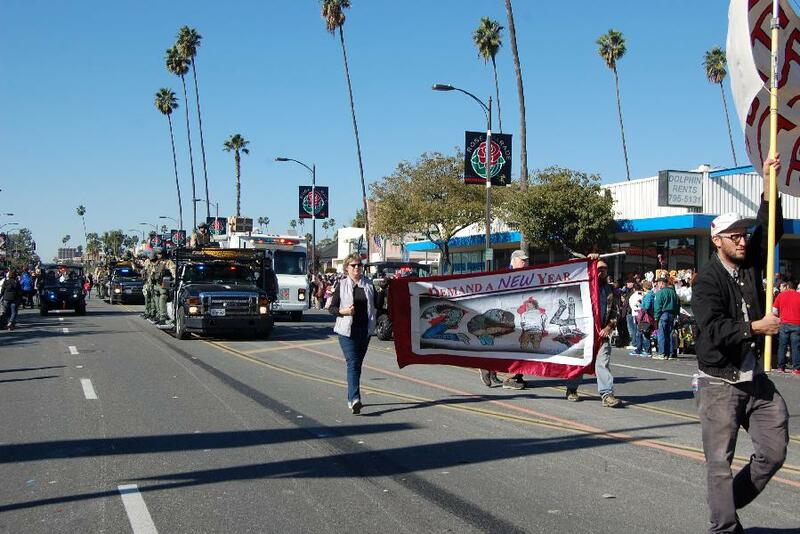 The Occupy the Rose Parade #OTRP tradition continued for the fourth year in a row on January 1, 2015 with a people’s parade trailing the official Tournament of Roses Parade in Pasadena, CA. 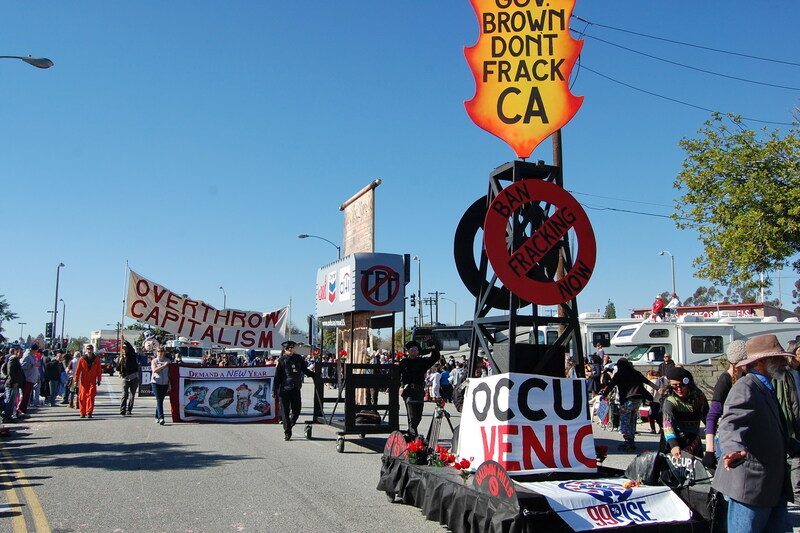 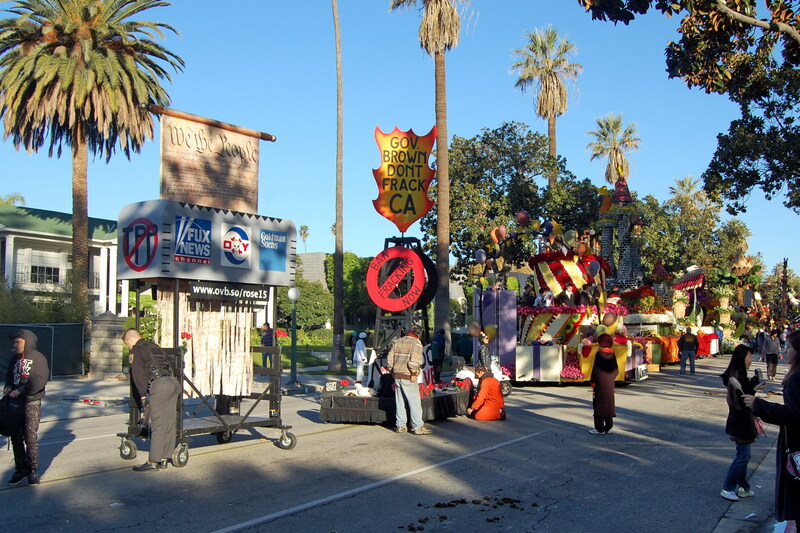 Learn more about Occupy Venice Beach’s 2015 people-powered Rose Parade float at http://www.ovb.so/rose2015. 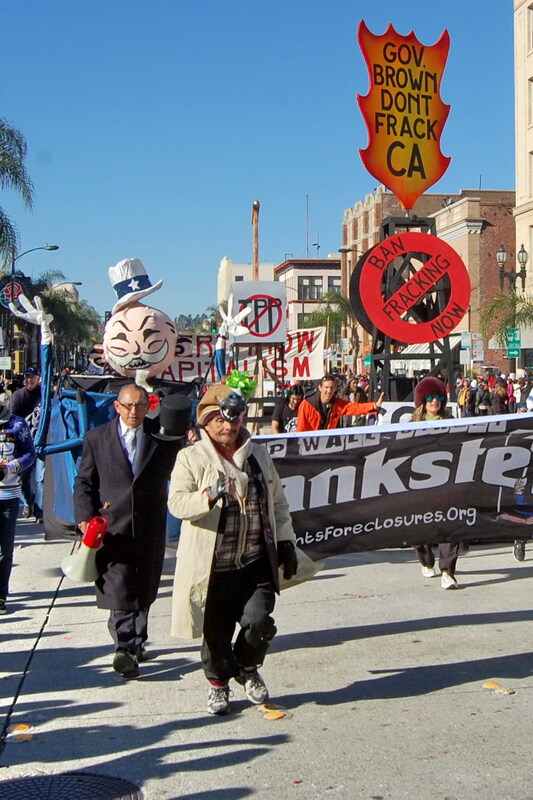 Visit Occupy Fights Foreclosures online at http://www.occupyfightsforeclosures.org.